Last post I mentioned I’ve started making monster smoothies for my pre-training breakfast. I can’t take credit at all for the recipe. I got the basics of it from family friends when I was first out of college. I was investigating the Zone diet and weight training for 3 hours a day. Oh, to be 22 again and be able to handle that! In the past I’ve added extra supplements, like flaxmeal, etc. I have mixed up the fruit by using frozen berries of other types. It is a lot of calories, and that’s why I had stopped making it for a number of years. A local cafe makes a very similar smoothie and my husband recently had jaw surgery, and I’m hoping it can help his recovery while he is on a liquid diet. He’s also diabetic, so I’m using 50% sugar reduced orange juice to help reduce the overall sugar. What I do know is the last 2 workouts with this smoothie 1 and a half hours before training, I have totally rocked it. There has been so much going on that it would be pretty impossible to totally update you! The road trip was good but I didn’t get nearly enough workouts in. I paid dearly for it when I got to the gym for my next training session with Neal. But, I really tried to do my “homework” and I think I bounced back pretty quickly. I’m messing around with training nutrition. I have started making my “monster smoothies” again rather than the breakfast sandwiches I had been making before morning sessions with Neal. I feel great and I’ve had no loss of energy part way through. Monster smoothies are calorie mongers though – so it’s something I have to be mindful of. 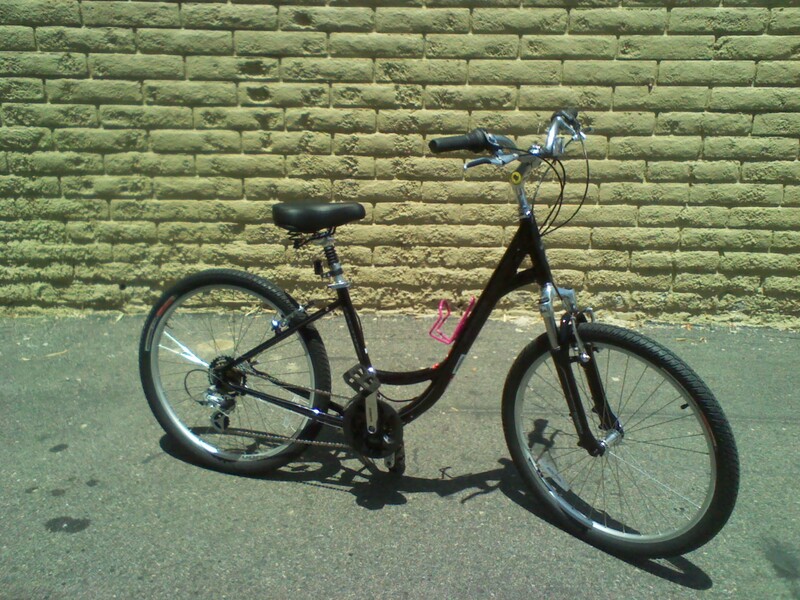 Right before I left for the road trip – I bought a bike! And I FINALLY got to ride it this weekend! Maybe I won’t set any speed records with this baby, but it’s a start. The ride was good – it ended up being around 5 miles. Not bad since I haven’t ridden a bike since I was 13! I did okay on the road with traffic. Luckily we have great bike lanes in SoCal. Sadly, I wasn’t really able to control the bike really well and I took up most of the lane with weaving! And man, does my rear end still hurt! It has been HOT HOT HOT here. And by that I mean, 80’s. The horror. So I’ve been hitting the pool for my cardio. I’m definitely getting the hang of in pool freestyle. I tried using a nose plug but it didn’t stay well and actually really hurt my nose. So I need to work on training myself to breathe OUT when the face is in the water and not end up inhaling the whole pool.